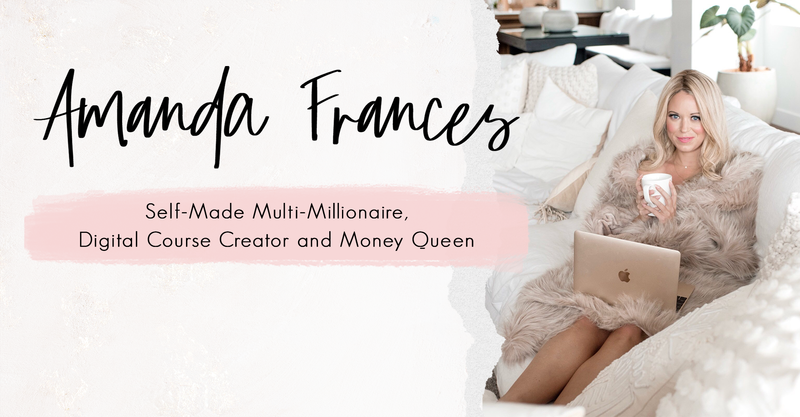 Amanda Frances is a self-made multimillionaire, digital course creator, Forbes contributor, podcaster, and spiritual business mentor to the hundreds of thousands of women who follow her work online. In the world of personal development, she is widely known as the, "Money Manifestation Queen." Amanda’s mission is to empower women to “design lives and businesses that they are wildly obsessed with.” She daily strives toward this through the continual creation of her wildly popular digital courses, her "And She Rises” Podcast, an on-going mastermind for high level women entrepreneurs, and through her daily free inspirational content distributed across her social media channels. Combining her background in ministry as well as mental health counseling with practical business advice and a deep knowledge of spiritual and energetic principles, Amanda isn’t quite like any other ‘business coach’ you’ve encountered. A true self-made women, while putting herself through graduate school Amanda taught herself how to build her first website. 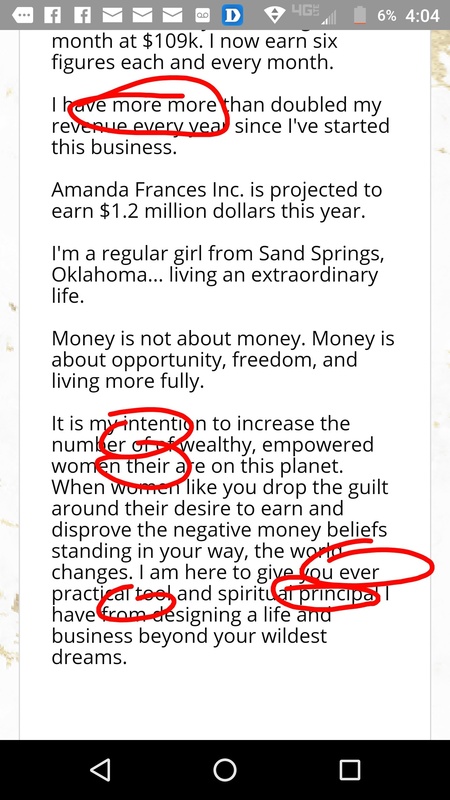 Eight years later, Amanda Frances Inc. is a multiple seven figure yearly brand, recently grossing $1 million dollars in in the first quarter of 2019. She credits her success to her sheer determination, a deep desire to serve others, and an unwavering belief in her own dreams. Amanda earned a Masters of Science in Counseling from Southern Methodist University and a Bachelors in Psychology from Oral Roberts University. She is a native of Tulsa, Oklahoma -- but in July 2016 -- she put everything in storage and took off to see the world before landing in Malibu, California. Agreed! Keep doing what your doing. I love your content Amanda. You make this stuff fun. it’s fun being a millionaire with typos everywhere. looks like that’s not really want matters to my audience. I have one question about your coaching program. You mentioned that you do not need a life coach certification to become a life coach, so your program is not apart of that certification or is it? I am so interested in becoming a life coach I’m just a little confused on what I have read online. Hi Kristina! Coaching is an unregulated field. Legally, you do not need any certain requirement to start coaching. My program is to give people the basics is starting their own online coaching business (: email me at amanda@amandafrances.com eith any questions. Thank you so much for responding! This is super helpful! I am a single full time dad of 3, 2 girls and 1 boy. I have had full custody for the past 6 years since their Mother disappeared without a word. She is fine and sees our children 3 Saturdays a month now. That started last month. I have experienced a work injury (while working with electricity) that may prevent me from returning to my job. I still have 3 children, a German Shepard, mortgage and bills to provide for. My question is if your courses are only for women? You would be our third man in Become a Life Coach!! The two men who have taken it both really enjoyed it and are coaching now. Let me know if you have any other questions.